Gurugram: Sangathan means union, unity and consolidation. True to its meaning Sangathan celebrated every year at Amity University Gurugram embodies the spirit of competition, fair play and achievement. Sangathan is an annual Sports Meet of Amity group started in 1998. It is the brain child of our visionary Founder President, Dr Ashok K Chauhan. Sangathan provides a unique opportunity wherein students of all Amity Campuses from across the country and abroad showcase their talent and skills, competence and in sports and cultural events conducted over 6 weeks prior to the grand finale. This event greatly helps in developing multi-faceted qualities, and virtues among the students. This also leads to developing their overall personality resulting in faster career growth in the future. In keeping with the indomitable spirit of Amitians, the Founder’s Day is celebrated to honor the dynamic leadership and unfathomable achievements of the Founder President of the Amity Group of Institutions, Dr. Ashok K Chauhan. Sangathan is celebrated at two levels. At the first level, sports competitions are held at each Amity University Campus as ‘Inter Institutional Sports Meet’. At the second level, a mega Sangathan event is held at Amity University Uttar Pradesh at NOIDA on 27th October, whereby all Amity National and International Campuses come together in unison to participate and compete in a plethora of sports events. 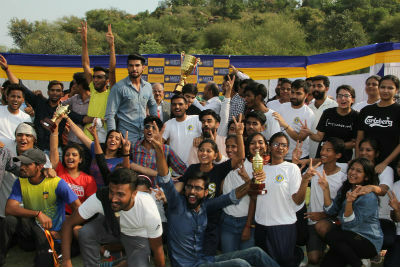 With total 34 events (19 games and 15 track & field events) more than 2,200 students from various institutions participated in the mega sports meet lock horns with their counterparts in various sporting events like , cricket , basketball, football , volleyball, kabaddi, throw ball, track & field events etc. The winners and runners up in various Sports were felicitated with Gold & Silver medals and Trophies. The team of Amity Law School, lifted the Overall Sangathan Team Trophy for the third consecutive time with total of 118 points in their kitty. The team of Amity School of Applied Science with 89 points was awarded the Second position. Gyanchand, Amity School of Engineering & Technology won the Best Athlete (Male) Award and Bhavya, Amity School of Communication took the trophy for Best Athlete Award (Female). The event concluded with singing of the National Anthem.